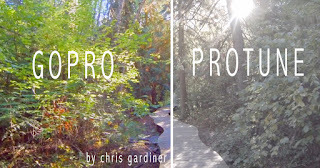 It wont take you long to stumble upon your "protune" setting within the gopro menus after you get one. If you're like I was when I first got my GoPro Hero 3 Black in 2013, you may even avoid tinkering in there until you know what the deal is. Well this is a little post to give you example of what protune is and isn't and what it can allow you to do, and hopefully help you decide whether or not you need to shoot in it. What is it? Protune is a setting in your gopro camera that minimizes the compression, and exposure settings programmed into regularly captured footage. That translates into a little extra data being written to your memory card, second for second with non protune footage. So on top of just writing more data to your card and compressing less of the image, it is also sending what is closer to being the 'raw signal' that your camera's sensor sees, similar to how DSLR RAW files compare to JPGs. What it isn't? Well it's not an instant recipe to better looking gopro footage. In fact, if you don't typically apply color adjustments to your footage already, you probably don't even need protune, it will actually make you start off with a flatter looking more washed out image than you're used to. Not only that, but the extra data to handle may slow down your computer, editing software, and fill your hard drives faster, in other words - it could throw a wrench in your workflow. So why would you use it? The more washed out image means that more of the data is located in the midtones and less of it is crushed blacks or blown whites. So it gives you more editing latitude in your color and exposure changes, which can make it easier to pair that footage to similar clips captured on different cameras. Personally, I only shoot in Protune. Not that all of what I do with a gopro is for professional use, I just like to have that built-in latitude for playing with my video should I ever want to. And last question that most everyone new to protune is going to ask ; "How do I use it?". Most of the time when I work with my protune footage, say clips for my stock footage agency, or a client video I am working on, I'll find the right white balance first. I always shoot with my GoPro locked at 5600K I think it is. I just find it easier to correct later if the WB isn't bouncing around, and if it's always the same. I rarely use indoors, so its always not far from daylight color temperature. It still, even for outdoors in daylight shots, may need a little bit of white balance and color adjusting. So to do this, first I blow up every saturation slider I have. This helps me see the margin of error from the true white balance more clearly. So with your saturation way disgustingly nuclear, take a careful look at your image highlights midtones and shadows. Do any of them appear to have too much of a particular colour? It should be blatantly obvious with such a high saturation. If you can get your colors to look as close to real at 200% saturation, when you bring the saturation back down to a believable level, it should look spot on. After the white balance is ironed out, I will go in and work with the exposure sliders to decide where my black point will be, and same with the whites, in other words - decide how contrasty and where you want that contrast in your frame. You could leave it as is, and have all details your camera but chances are it will still look pretty flat and just with a whole lot more color than before. Finally, I'll make sure to run a little sharpen filter on my protuned clips, and thats about it. 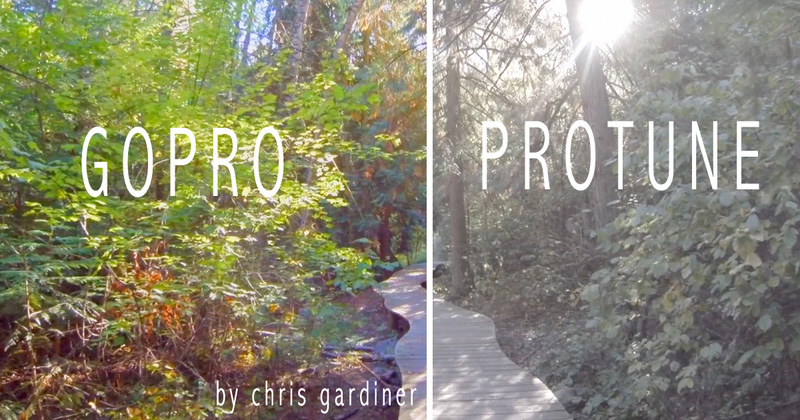 I've included a short video with this post that shows the changes you can make to a protune shot, to get it as good or better than the regular footage your gopro would spew out with 'protune off' in this before and after video.